What costs more than proactively investing in Inspection Readiness? 483 Remediation; product recalls, consent decrees, injunctions, seizures, and expensive delays in FDA approval (which also has a rippling effect - loss of jobs). Proactively plan and manage inspection readiness to mitigate risks. Outsource our highly experienced FDA Compliance Specalists today! FDA Compliance Specialist audits of internal QMS functional areas & suppliers strengthen internal auditing capabilities. Proactively identifying procedural, technical, personnel, or documentation gaps helps mitigate unnecessary / unwanted regulatory observations and facilitate FDA approval. Proactively training manufacturing quality personnel results in reduced wasted time, reduced materials, reduced regulatory non-compliance issues, improved quality and inspection readiness. 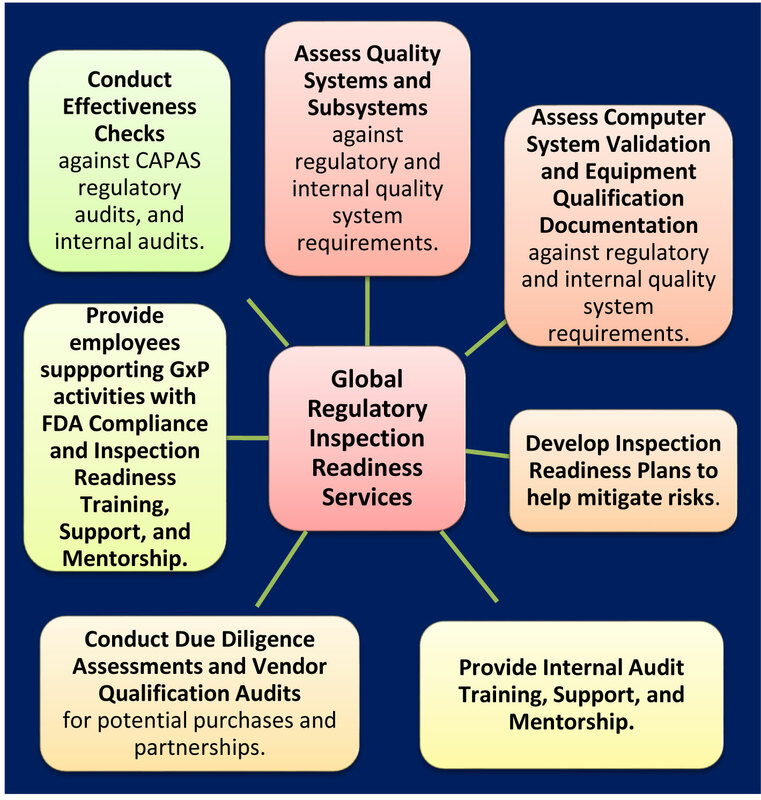 FDA Compliance Specialist documentation review to mitigate risks (e.g. internal QMS (policies, SOPs); Effectiveness Checks of CAPA commitments; CSV documentation; compliance training). Develop Inspection Readiness Plans to help mitigate non-compliance issues (e.g. QMS policies, SOPs, and work instructions; computerized systems; computer system validation; processes; training; internal and supply chain auditing).